I have had Test Anxiety for many years. My anxiety affected my Law School exams all the way back to my High School exams. I would panic, stress, and worry when it came time to take exams even though I knew the material. I would just freeze up. 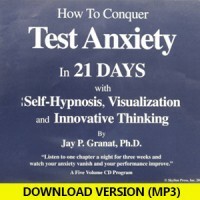 When I found Dr. Granat’s “How to Conquer your Test Anxiety” I found a wonderful solution to my problem. I truly love and enjoy the program as whole because it is excellent and it works. However, I have certain techniques that are my favorite such as the candle, the bath, the music, the campfire, the Y trance, the wound, the Cognitive, and the Serenity Prayer just to name a few. I practice all the techniques I learned throughout the program daily. I recommend this to anyone who suffers from Test Anxiety so you too can conquer your test anxiety and prevent it from getting in the way of your success just as I have. Now you will be able to choose your favorites out of the program. Here is a simple idea that can help you on your next test. Tell yourself that with every question you are getting more relaxed and that your self confidence will grow as you move through the exam. Practice test score can be useful indicators of how comfortable you are with your exam. This is true for many standardized test. It is very rare that a person will score poorly during practice and then do well when they take the actual test. So, try to get your practice score to approximate the score you would like to get on the real test. Work at improving your ability to handle the part of the exam that you are weakest at and fine tune the parts of the test that you are comfortable with. Raising your practice test scores can build your confidence and lower your test anxiety. Comments Off on How To Get A Perfect Score On The SAT Or ACT? I have spoken to a few people who have received perfect scores on the ACT and the SAT. Obviously, these are very bright young people. Interestingly, they seem to approach the exam with a sense of curiosity. In addition they seem to be looking at these tests as a challenge and they are not intimidated by the pressure. It seems that they did not focus on the pressure at all. Rather, they focused on the material and the task at hand. A recent news report said that some employers may ask for your SAT scores. I think this is a bad idea since these tests have little to do with how successful one can be in the world of work. If this becomes a trend, it may increase the anxiety people experience around tests. Last week, I lectured to approximately one hundred student-athletes and coaches at The Leadership Program at The University Of Delaware. This is a wonderful institution with a great sense of community. I have been a university professor at two institutions and I have visited many college campuses over the years, and I was delighted to see that this university encouraged a climate of closeness and camaraderie among it student-athletes. I might add that the students and the support staff could not have been more polite and more accommodating than they were during my visit to this campus. Attendees at this seminar included members of the lacrosse team, the tennis team, the golf team, the dance team, the track team, the basketball team and the softball team. psychology, mental toughness, hypnosis and peak performance. My visit to this university also caused me to reflect on some of things student-athletes need to be aware of in order to choose the right institution and in order to have a successful athletic and academic experience. 1. Choose a university which is right for you. Consider the size of the school, the distance from home, the scholarship package, the financial value, the majors offered, the internships available, the climate and the quality of the academic programs and the sports programs. 2. Get a good sense of the school’s expectations and goals where you and your team are concerned. 3. Pay close attention to how you and your parents feel about the coach. In short, you want a coach who is a fine person and who has a great deal of knowledge and skill about your sport. 4. Get to know your potential teammates. Your relationships with them have a lot to do with how things will go for you at the institution you are considering attending. 6. Talk to current athletes and to athletes who have graduated from the institution. Assess the quality of the relationships they have and have had with the people who you will be interacting with on a regular basis for the next four years. 7. Find out about the amount of time you will need to spend in practice, training and studying during your stay at the university. Balancing academics and sports can be a real challenge for many students. 8. Find out what kind of training you are required to do in the off season. 9. Don’t jump at your first offer. This is an important decision, so be patient and thorough as you go through the process. Visit a minimum of three or four schools before you make your final decision. 10. Going off to college can be a huge adjustment for athletes and for non-athletes. There are many challenges: managing time, managing money, sharing a room, adjusting to larger classes, living away from home, joining a fraternity or sorority, and managing social distractions are all part of getting used to this phase of your life. 11. This is a special time of your life. Try to find a mindset that allows you to learn, grow, explore, develop friendships and have an enjoyable experience. 12. Competing on the college level can be quite challenging. Some student-athletes feel like stars in high school, but feel less important and less prepared when they compete at the college or university level. You may benefit from some training in sport psychology so that you can better master the mental aspects of your sport. Jay P. Granat, Ph.D. is a psychotherapist in River Edge, New Jersey and the Founder of www.StayInTheZone.com. He is the author of numerous books and program for student-athletes.